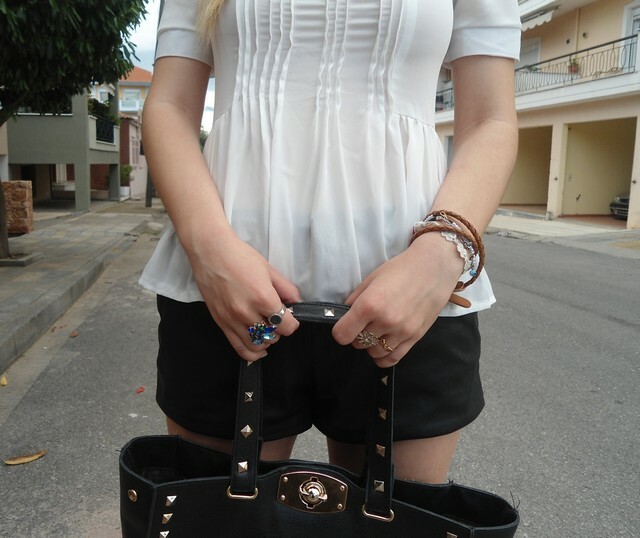 This outfit is about how to style your winter leather shorts for a summer outfit. I received this adorable top some days ago and finally made it to shot it with my new photographer for this month -mommy-. What I mostly like on peplum tops are their feminine shape, I think they flatter almost every woman. This top is really cute due to their romantic details like collar and polka dots on the transparent part, totally love it! This is such a special outfit! Totally love it Mary! You really look so feminine! You look more than wonderful!!!! LOVE your color shoes!!!! Mou aresoun polu ta papoutsia!!!! the top is super cute and the shoes are lovely! great colour!! Love top and heels, great look! My new blog post: How to wear gold shoes? the top looks gorgeous on you! :) lovely outfit! Great Blog too. Please check us out over at DustyRoses and what we do for young fabulous women. Leave comments and follow us back! Yours pumps are so amazing, I love the colour!! Nice peplum and I love your pumps. Πολύ ωραία η μπλούζα! Το συνδίασες πολύ όμορφα! Φιλάκια πολλά! You look great. Nice outfit. Lovely top and also great shoes! You look so chic and elegant! that white peplum looks amazing on you! and i love how you styled it! Το χρώμα των παπουτσιών είναι ονειρεμένο! Και το πουκαμισάκι πολύ ωραίο. Amazing look! I love your outfit and your hair is gorgeous! Amazing look, love that top! That little peplum top with the mint shoes....swoon <3! You always look gorgeous! love the splash of color from your shoes! J'adore le top pelpum,et ton short aussi est vraiment très beau! !